Masterman boys placed four in the top ten led by winner Keaton Naff (17:50) to win race B with a score of 35 points. Karon Keene of Strawberry Mansion won race A in 20:19. Parkway Northwest scored 58 points to win by 6. In the charter school race, Franklin Towne Charter placed three in the top four led by winner Angel Lazu (17:38) to win the team title with 40 points. For the girls, Engineering and Science scored 49 points to win race B led by winner Kanae Taylor (20:49). Ce'arra Brown of Overbrook won race A in 23:30 to lead her team to the team title with 43 points. In the charter school race, Kelly Wint of Mastery South ran 23:57 to win the race. Franklin Towne Charter placed five in the top eight to win the team title with 26 points. Courtney Smith of Unionville ran 11:18 for 3200 meters to win the gold medal by six seconds over freshman Amber Hontz of West Chester Rustin. Unionville had six in the top eight to win the team title with 19 points. For the boys, Charlie Grab of West Chester Henderson fought off Kenny Leidal of Downingtown West by one second to win the race in 9:40 for 3200 meters. 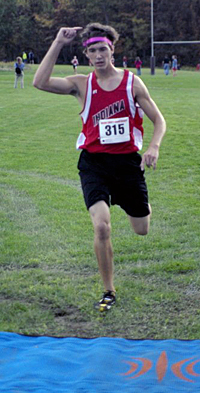 Henderson placed five in the top six overall to score 19 points and win the team title. Angel Piccirrillo of Homer Center successfully defended her Indiana County championship, winning this year championship with a time of 19:54.2, 26 seconds better than silver medalist Veronica Budjos of Indiana. Budjos's team would place their scoring five in the top fifteen to win the team championship over Marion Center 48-56. Marion Center had three in the top ten to keep it close. For the boys, Indiana used a 1-2 finish from county champion Tyler Zolocsik (17:19.4) and Adam Lenze (17:38) to lead their team to the team championship over Blairsville 40-66. Quaker Valley came away with both the boys and girls team championships, with the girls having a tougher time winning than the boys. The top ranked AA girls squad placed five in the top fifteen to score 45 points, only five points better than West Allegheny, who placed four, but the Quaker Valley 5th runner was five places better and secured the team title for her team. Dee Dee Adams of Freedom Area won the girls league championship with a time of 21:02. The Quaker Valley boys flexed their muscle once again. The PA#7 and top ranked AA squad had three in the top eight led by league champion Nat Fox (17:36) to score 43 points and cruise to the league championship. The Bethel Park boys played spoiler at Baldwin's annual end of season home invitational, defeating the host school 71-76. Baldwin placed two in the top five led by individual winner Andrew Kutcha (16:22.5) and 4th place finisher George Kelly (17:34). But Bethel Park placed five in the top twenty led by an 8th place finish from Thomas Bailey (17:58.4) and a 34 second spread to take home the team title. For the girls, Upper St Clair used a 2-3 finish from Betsy Erlanger (20:25.1) and Leah Griffith (21:14.9) and placed their scoring five in the top 30 to win the team title with 76 points. Individual gold went to Kirsten McMichael of Ringgold, who ran 20:08.9 to earn the victory. Hempfield girls survived Norwin's 1-5 finish from county champion Autumn Greba (19:58.7) and Jenna Kuhn (20:43.8) to win the county team championship 66-71. Morgan Ansell led the way for Hempfield, running 20:34.8 to finish 4th. For the boys, Kiski Area doubled up the rest of the field, placing four in the top seven, including county champion Brent Kennedy (16:26.9) to win the team title over runner up Norwin 34-70. Drew Magaha put on an impressive performance in his final regular season tune up, running a strong 15:35 to win the gold medal by over 50 seconds! Magaha was the major PA highlight, as West Springfield of Virginia had the girls individual champion (Caroline Alcorta 18:20) and they came away with both team title. The boys scored 73 points to win by 15 over Central Bucks South and the girls scored 30 points to win by 39 points over Upper Dublin. Sarah Holl was the top PA finisher, leading her Upper Dublin team with a 3rd place finish in 19:02. North East boys continued their NY winning streak, winning their 2nd in a row in NY, placing three in the top seven to score 39 points and win by 31. Ryan Smathers was solid once again, finishing 2nd with a time of 17:46.3. Oswayo Valley's Barrett Kemp earned another victory, running 17:32.6 to earn gold and lead his team to a 2nd place finish. For the girls, Anne Lewis of North East finished 2nd with a time of 21:59.6. Her silver medal performance led her team to a team title of their own, scoring 60 points to win by 8. PA's top ranked Cardinal O'Hara out did their 2010 DELCO championship performance, placing 1-3-4-5-6 to score 19 points and repeat as county champions. The score was one point better than the 2010 team, and was the 14th title in the 47 year history of the event - more than any other school. Dan Savage led the way for O'Hara, winning the gold medal in a nail biting finish, holding off Jack Huemmler of Strath Haven in the final few meters to win the race. For the girls, Hannah Grossman repeated as county champion, running a comfortable 18:28; joined under 19 minutes by only one other athlete, Sophia Meehan of Haverford Township. Grossman's team also had a big day as well. Strath Haven's 2-5 girls placed 18-19-20-22 to defeat defending champions Haverford Township by eleven points. DELCO CHAMPS!! SATURDAY 10-15-2011 Rose Tree Park 37th year!!! HAVERFORD appears to be the odds-on favorite to win its second DELCO team championship in a row(2010 was its first since 1982). HAVERFORD’s coach Kristi (Jamison-Haverford alum) Ritchie has planned this season to hopefully run its best by Districts, and DELCOS will be only their 3rd weekend invitational. HAVERFORD returns 5 of their top 6 from their 2010 Championship. HAVERFORD was undefeated in the competitive Central League this year and finished 1st at Abington Inv(scoring 69 points defeating Great Valley(2nd-90) and STRATH HAVEN(5th-130). At Paul Short they continued to run well, coming in 6th (behind PENNSBURY, WALT WHITMAN(MD), DOWNINGTOWN EAST, STATE COLLEGE, and CENTERVILLE(OH)). HAVERFORD scored 301 points defeating county teams-- NOTRE DAME(423), STRATH HAVEN(579) and OHARA(686). As for the runner-up trophy, NOTRE DAME(2nd 2010 1st 2009) is the favorite with a strong Top 2, a solid 3-4, and a quickly improving #5. AGNES IRWIN(looking for their 1st ever DELCO trophy) has 4 seniors who have been developed beautifully by their veteran and always congenial coach. They came in 4th in the Paul Short “White” race, but would have been 3 points ahead of STRATH HAVEN if they had run “Brown”. STRATH HAVEN(4th 2010 2nd 2009 1st 2008) has a super #1 and about 13 other pretty good runners. For them to have a chance, at least one of that day’s varsity 6 must be in the TOP 20. OHARA(3rd 2010 3rd 2009) is improving and has closed the gap on the other Top teams! (Kelly OH 10) may give them the runner up front to lead their talented pack!? A STRATH HAVEN runner has won the individual championship 3 of the last 4 years(Frick 2007--Rutkowski 2008--Grossman 2010). At this point of the season senior(defending champion) Hannah Grossman(SH) appears to be the slight favorite. Hannah finished 1st at Abington, 2nd at Briarwood “Large”, 4th at Bull Run(MD), and 5th at Paul Short(18:26). Grossman(SH) has not lost to a DELCO opponent this year, but she barely beat one of her toughest rivals, senior Maria Seykora(ND), at Paul Short by 4 seconds(Seykora(ND) did run much faster than Grossman(SH) in different races at Briarwood). Seykora(ND) also has performed really well in a # of tough meets(3rd PTXC3, 4th Briarwood “Championship”, and 2nd Carlisle “Puma Challenge”. The only other girls with a legitimate shot at becoming the DELCO CHAMPION are senior Sophia Meehan(HAV) and junior Tess Meehan(HAV). Sophia(HAV) was runner-up as a freshman and a junior and 6th as a soph. She is a strong 800M runner(as evidenced by her PIAA STATE medal last spring) and if she can hang on, she may be able to kick it in and kick down the door to her 1st DELCO Individual Championship. Sister Tess(HAV) is also coming on, and after her freshman year 10th place STATES finish, she has shown she is capable of a big race!! Good luck to Tess, but as coaches most of us love to see SENIORS getting the top prizes!! Three of the better runners in DELAWARE COUNTY history will graduate this year----and one of them will go off to college as the reigning DELAWARE COUNTY GIRLS XC CHAMPION!!! There will be 20 plaque winners and the TOP 7 girls are likely to make 1st team ALL-DELCO. 4 of those spots will likely go to Grossman(SH 12), Seykora(ND 12), S.Meehan(HAV 12), and T.Meehan(HAV 11). The other 3 coveted spots will be a real battle?? Here are the possible 5th thru 7th finishers(in no order)----Chang(PC 11)(6th 2010 2nd 2009), Rudawsky(GARV 11)(7th 2010 27th 2009), Powers(ND 12)(9th 2010 22nd 2009 19th 2008), Wunisch(AI 12)(36th 2009 56th 2008), Galligan(SF 10), and Kelly(OH 10)(24th 2010). OHARA! OHARA! OHARA!---Last year’s team victory at DELCOS was unbelievable! Their Top 5 finished 1st, 3rd, 4th, 5th, and 7th and 4 of them are back!!! 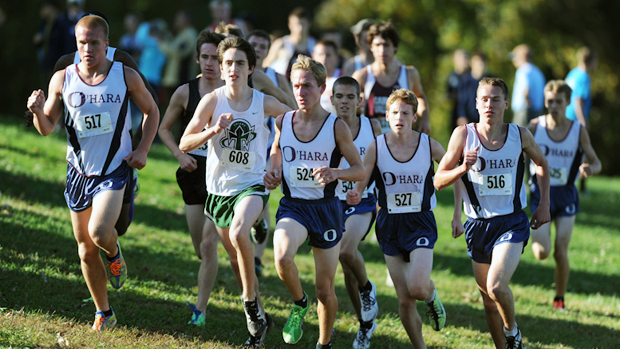 Historically, OHARA has dominated the DELCO XC CHAMPS. Coach Tom Kennedy’s harriers have been FIRST 8 of the last 13 years, SECOND 4 of those years and only out of the TOP 2 in 2008. This year OHARA is ranked #1 in PENNSYLVANIA claiming 3 impressive TEAM wins so far--Briarwood Championship, PIAA Foundation “Gold”, and Great American(North Carolina). No DELCO team is even close to them this year. OHARA will make more TEAM HISTORY this Saturday! At least there may be a TEAM race for 2nd!? Central League foes, Haverford(3rd 2010), Strath Haven(4th 2010), and Penncrest(2nd 2010), will likely fight it out on Rose Tree’s hills. Haverford has a deep team and their 5th runner is very close to their first. It is possible they could have 5 runners in the TOP 20. As for Strath Haven, Their top 2 are really strong, but they need their 4th and 5th to move up. Penncrest always runs well at DELCOS, and 2011 will probably be the same. Lets look at some more HISTORY. 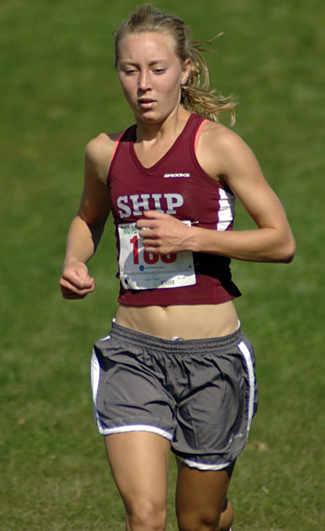 An OHARA runner has been the DELCO Champ 7 of the last 11 years(including 2010). Last year’s returnees are 3rd-Bilotta(OH 12),4th- Savage(OH 11), 5th-Pastore(OH 11), 7th-Ostroski(OH 12), 12th-M.Kazanjian(PC 10), 15th-A.Smart(GARV 11), 16th-Seelaus(SH 12), and 17th-N.Smart(GARV 10)(YES! The Smart’s are BO Smart’s kids). So far this year 3 of these runners appear to be the favorite at the 2011 DELCOS. Savage(OH 11)has been #1 for his team in all races this year. He is consistent and very tough! Seelaus(SH 12) won the Abington Invitational and BULLDOG and has greatly improved in 2011. Bilotta(OH 12) has been close to Savage(OH 11) all season and could be ready to break through. 4th through 7th(ALL DELCO) will be a battle among Pastore(OH 11), Ostrowski(OH 12), James(OH 9), Huemmler(SH 11), M.Kazanjian(PC 10), Kays(HAV 12), Bodine(HAV 11), and O’Donnell(GARV 12). Canton won the boys varsity race with 42 points, 16 better than 2nd place Northeast Bradford. Canton placed five in the top 12 behind the 4th place finish of Emmett Watson in 18:41. Northeast Bradford took the top two spots in the race. Juniors Sam Williams and Curt Jewett went 17:22 and 17:44, respectively. In the girls race, it was Vestal NY by 24 over the host team, Montrose. Vestal's Alicia Sutphin captured 2nd, three second behind meet champ Violet Learn, a sophomore from Mansfield. Montrose was led by the 6th and 7th place finishes of sophomores Samantha Bennici and Allison Lewis, who went 23:10 and 23:31, respectively. Chambersburg boys put four in the top eighteen led by an 8th place finish from Nick Rotz (17:09.7) to escape with the team title over Lower Dauphin 87-89. Lower Dauphin had the runner up finisher in sophomore Jeff Groh (16:45.4) and two more in the top fifteen to keep it close. 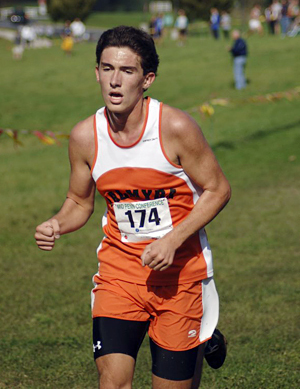 Individual league championship honors went to Connor Strynkowski of Palmyra, who ran 16:42.6 to win the title. For the girls, Palmyra ran comfortably to the team championship, placing four in the top sixteen to score 74 points, led by a 5th place finish from Laura Duquette. 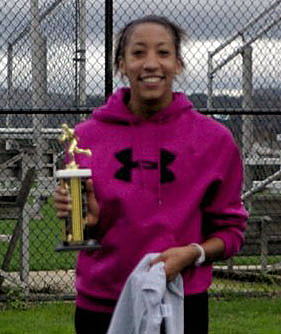 Reynah Spence of Shippensburg ran 19:09.5 to become the league champion. Her time was the 2nd best on the course, surpassed only by her older sister, Neely. Holy Ghost Prep boys took a trip to Van Courtland park and gave the local teams a run for their money. Led by a 3-4 finish from Zachary Israel (13:11.6 for 4000 meters) and Ryan Horgan (13:27.9), Holy Ghost scored 51 points to finish 3rd, 6 points behind 1st place Haddonfield (NJ) and 5 points behind 2nd place Pope John XXIII (NJ). Kennedy Weisner of Elk County Catholic ran 19:37 to earning her fourth invitational win in a row. Her team had three in the top ten, but were surpassed by five in the top 25 from Conneaut Lake, earning them the team title of Elk County Catholic 74-83. Freshman Brooke Phelps finished 7th for Conneaut Lake. For the boys, a 2nd place finish from Caleb Lecker (17:43) was enough for Elk County Catholic to defeat Cochranton for the team title 114-121. 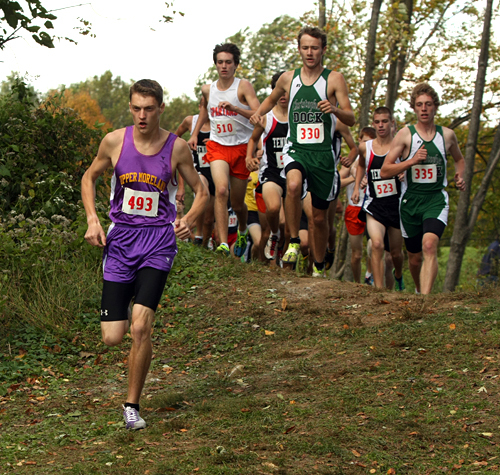 Gordon Phipps of Oil City came away with the individual gold medal, running 17:20 to win by 23 seconds.